Good afternoon. It's a great pleasure to be here with you today, addressing such a large gathering of maritime and financial professionals and experts. 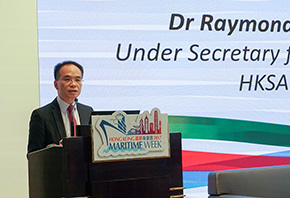 I know that this is the first Forum jointly organised by our Hong Kong Maritime and Port Board ("HKMPB") and the Financial Services Development Council ("FSDC"). May I extend my heartfelt thanks for Florence, Winnie and other FSDC working group members for co-organising this meaningful Forum with us, and the Hong Kong Monetary Authority for providing this great venue for exchange of thoughts and brainstorming of new initiatives over shipping-related financial and insurance services. Let me start with a few numbers. Over the past two decades, the real GDP of Hong Kong has grown by an average of 3.2 per cent a year, notably higher than that of the world's advanced economies, which grew just around 2 per cent a year on average. The stable growth of our economy is largely contributed by the strong economic growth of Mainland China, which has grown at around 8 per cent per year on average in the past decade. For 2017, the estimated growth rate of China is around 6.5 per cent, and as for Hong Kong, we are anticipating a possible economic growth of up to 3.7 per cent. Meanwhile, our per capita nominal GDP is expected to reach a new high of almost HK$360,000. This in fact surpasses many major economies such as Germany, the United Kingdom and Japan. What's more, Hong Kong's stock market offers some of the best liquidity in the world. For the past two years, we have been ranked number one for funds raised through initial public offerings (IPOs); and we have been ranked among the top five in IPOs around the globe during the last 15 years. The market capitalisation of our stock market in 2017 is in fact eight times larger than it was in 1997 – mounting from HK$3.2 trillion to more than HK$28 trillion. On the maritime front, with a population of slightly over 7 million, Hong Kong has a long maritime history with a vibrant and comprehensive maritime cluster. We are home to a strong base of shipowners – members of the Hong Kong Shipowners Association own or manage almost 10 per cent of the world's merchant fleet in deadweight tonnage terms. Currently, more than 800 maritime companies are operating here to provide a myriad of professional maritime services, from ship management, broking and chartering, to marine insurance as well as maritime legal and arbitration services. Not to mention we have a world-renowned Hong Kong Shipping Register, which ranks fourth in the world, with some 113 million gross registered tonnage so far. And, despite the recent heated debate over the use of land of the Hong Kong Port, our port remains one of the world's busiest, which handled about 19.8 million TEUs in 2016. All of the above figures reflect two important facts – firstly, Hong Kong is, without doubt, an international financial centre and an international maritime business centre; and secondly, the HKSAR Government always attaches utmost importance towards economic development. That is why driving economic growth of our various pillar industries, including maritime and port, is always tops on our policy agenda. Ladies and Gentlemen, whether you are from the financial sector, the insurance field or the maritime industry, you have generated significant economic contributions to the growth of Hong Kong. The concerted efforts made by each of you are keys for Hong Kong to further excel in the years to come. Today's Forum focuses on ship finance and marine insurance, both are high value-added services in the maritime industry which demonstrate strong growth and are gaining traction. On ship finance, it is encouraging to note that the shipping loans and advances in Hong Kong have risen by 14.1% per annum over the past decade, amounting to more than HK$101 billion in 2016. Their share among the total loans and advances has increased from 1.4% in 2006 to 2.0% in 2016. To date, seven out of the world's top 10 bookrunners on syndicated marine finance loans have established their presence in Hong Kong. To put it simple, ship finance is just an area of potential growth that must not be missed. On marine insurance, we have close to 90 marine insurers underwriting hull and machinery and/or cargo risks for local and international clients. Among them, 35 are foreign insurers. The total gross premium of insurance on ships in Hong Kong surged by 10.3% yearly on average in the past decade, which is higher than the annual average growth of 7.1% for general insurance business. We are also a hub for Protection and Indemnity ("P&I") insurance, with 12 out of the 13 principal P&I Clubs having established offices in Hong Kong, making it the largest cluster of representatives outside London. I can assure you that the promotion and development of marine insurance services is definitely on the Government's agenda in terms of maritime and insurance initiatives. We are making progress, but there is no room for complacency. Keen competition from neighbouring maritime cities and countries and uncertainties arising from sluggish international trade are posing challenges to us. That notwithstanding, challenges always come with opportunities. The Belt and Road Initiative, the Guangdong-Hong Kong-Macao Bay Area Development Plan and the lately signed Free Trade Agreements between Hong Kong SAR and the ASEAN are bringing immense business opportunities to us. As the old saying goes, only the early birds can catch the worms. To grasp these opportunities, we need to act fast and act right. To this end, this Forum is a sure step and timely platform for the Government and the industry players to gather and explore ways to grow a bigger economic pie. I understand that throughout the years, the FSDC has in fact been conducting research and making recommendations on various financially-related subjects, including today's two services. I look forward to hearing more inspiring thoughts from all of you, and I wish you a fruitful and insightful discussion. Thank you.